This simple yet precise build takes your camera for a spin in order to take spherical and multi-row panorama photographs. 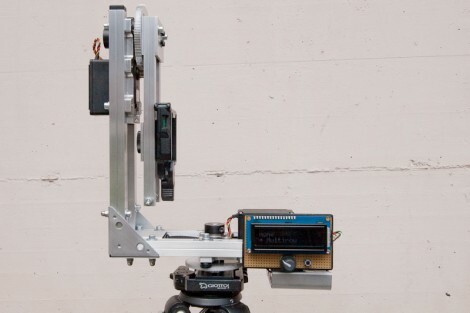 The rig mounts to a tripod, using two servo motors for motion, producing images that can be stitched together perfectly. An Arduino handles the hardware with an LCD interface for dialing in the settings.It’s not the cheapest way to get 360 degree shots but the example images are amazing. Wow, nice build and stunning images. I like panoramics. I’ve been messing with converting a scanner but this seems way better. Couldn’t find any info on the software package used to stich the photos though. If the OP is here: what camera are you using and I assume it mounts to the thing with the level? How did you calculate the correct locations for the axes of rotation? It varies based on lens focal length, right? That’s pretty slick. It puts the advertisement for the “only 360-degree imaging solutions” at the bottom of this post to shame. Can’t even focus on the build. Too jealous of that house to think straight. I came across Hugin (available for Linux, Mac, and Win) just this week. From the little I’ve messed with it, it seems to do a very good job. I’m not sure what he used to create these (or even present them on the web), but my favorite is the incredible PTGui software. I do this with a Canon pocket camera, Running CHDK and a LEGO NXT robotics Kit. havnet made a propper “writeup” yet. but it works well. This is mindblowing. I wish there were some sort 360 degree picture format, that you could actively scoll through a picture with, without a flash program needed. I saw he used a rotary encoder- those are not cheap- you’re looking at several hundred dollars for that alone, unless he salvaged it from something. The forest picture is AMAZING. It’s like I’m actually standing right there! I want to mark geocaches like this now- with a 360 panorama showing the location, so if you get in the vicinity, you’ll know where to look. …Also, I’m with [imsolidstate]- the page has a lot of the useable code, but no actual build directions. These are the highest quality 360 images I’ve ever seen- this is an item that screams for a build log- how are the rotation axes calculated for a given camera? If the maker of this item sees this hack a day post, please comment on this work of art- I’d kill for a build log of all the parts in detail they used, and how it all was made. You should upload the images to the Microsoft Photosynth website. The panoramas it makes are very nice. True Bob. He also has lots of wasted space in the place. The comment about geocaching photos this way for future use is definitely genius, drew.